This tool estimates the cost of your taxi in Athens. Prices are based on the official taxi rates for Athens, Greece and include exception rates such as the fixed fare for a taxi from Athens Airport to the centre. Booking a taxi using a phone will incur a fee, for mainland Greece this is €1.92 for a simple call and betwen €3.39 and €5.65 to schedule an appointment. On Greek islands, the taxi fee for a simple call is €1.85 and between €3.27 and €5.45 to book an appointment. To use the taxi fare calculation tool, simply right-click on the map to specify your starting and destination address or use the input fields in the menu. The taxi costs have been calculated according to the most up to date tariffs (2012) and include a full itemisation of charges you can expect from your taxi trip. The charges also include the 13% VAT introduced for mainland Greece taxi services on 01/01/2011, and 9% VAT for Greek islands. 23% VAT. The graph shows a prediction of the total travel time and an estimation of time stationary in traffic based on a traffic forecast for the next 24 hours from the time of calculation. By moving the mouse over the graph the estimated taxi fare will be updated to reflect different tariffs (for example night tariff) as well as the fee incurred when the taxi is stationary. Traffic estimation is a new (*Beta / Experimental) feature and will only be included for the proportion of the taxi trip that is either inside the Athens or Thessalonki city limits. If the taxi travels outside of the city limits, Tariff 2 is automatically included in the calculation. This means that for every metre outside of the city limits a double tariff is applied instead of the normal Tariff 1. Currently, this feature has been enabled for taxi trips originating in Athens or Thessaloniki. 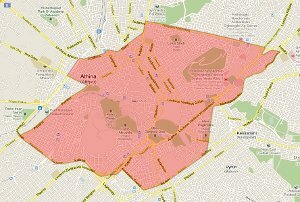 All taxis to or from Athens centre (specifically inside the red area shown in the below map or in more detail here) and Athens airport have a fixed fee that includes all charges (and VAT) - €35 If the taxi arrives at Athens Airport or in Athens centre after 5am and before 12am, and €50 if the taxi arrives after 12am and before 5am. The taxi calculator tool will automatically display this cost if you are traveling to and from Athens airport and the centre. For any other airport, or if not traveling to or from the centre, the standard airport fees will apply - These are shown in the calculation. The tool will automatically include toll road fees, and a standard fee if the taxi is from a Port, Train station (excluding Athens Metro and Proakstiakos/Suburban rail), or Bus station (excluding bus stops). This tool provides an estimation of the cost of a taxi trip given a reasonable path from A to B and is intended to give an indication of how much the trip may cost. Whilst every effort has been made to calculate costs as accurately as possible, actual charges may vary.